If you could dive deep beneath the sea and check out the teeth of the critters you found there, what would you see? Prepare to be very scared! 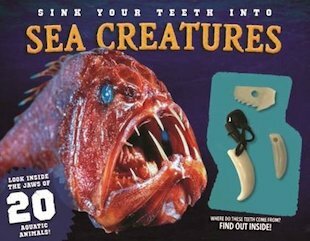 Yup: in this book you’ll take the role of a deep-diving dentist to examine the jaws of the ocean horrors that would love to have you for lunch! How can you avoid becoming a shark’s ocean snack? Why does the hideous anglerfish have such terrifying teeth? And what on earth is the menacing fangtooth? (Warning: keep your distance.) If you’re ready to answer those questions, take a bite out of this book!